As I type, it is Sunday night at the Sheraton in Dusseldorf; we had left our casa in Spain this morning and just returned from visiting this quaint German city for the evening. It’s been too expensive and inconvenient to connect to wifi in Spain, so I’ll be posting a few days’ worth as I sit here in the Sheraton lobby, in my Spongebob pajamas, past 11:30 pm. Yesterday, our last entire day, we headed to the nearby Cobapina beach for a few hours, having fun in the sun and jumping in the surf. I tried to get my dark on, well, as much as I could within two and a half hours. Dani really enjoyed playing in the sand, and just relaxing to the sound of the ocean was heavenly. This morning, we checked out and blessedly had a return airport transfer, so a private taxi picked us up and drove us to Malaga airport. 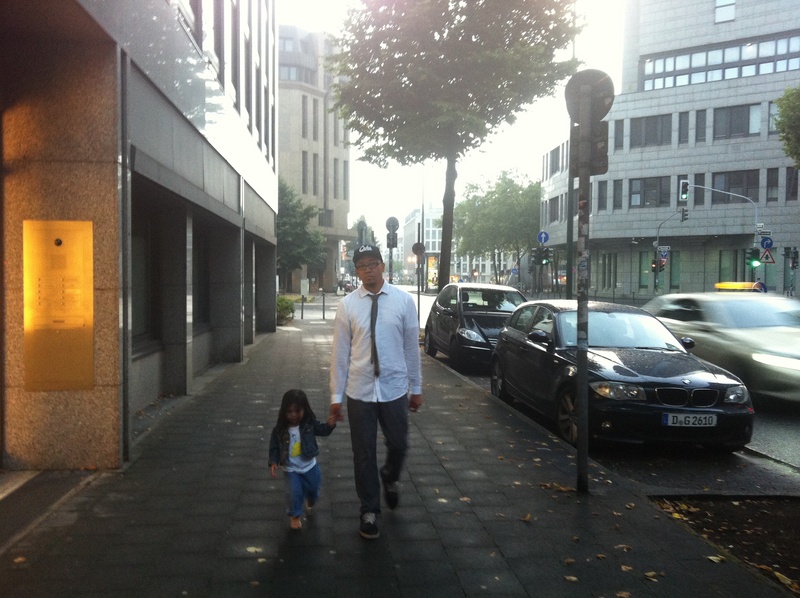 Our public transportation adventures hadn’t ended yet, at this point, but more on that later. At the check-in counter in Spain, we encountered a totally slow and/or confused lady who took over an hour to check in three guests, and here was Dani, screaming her head off, impatiently strapped into the stroller. I won’t even get into the little argument we had, since we had gotten on and off the plane with our bodies and luggage intact after all. But- pfft. I’m still annoyed. The flight seemed very quick, with Dani asleep about half the time. And the nice thing was that after grabbing our luggage, we only needed to cross the airport parking lot and take an elevator to the fifth floor, and we were at our hotel! 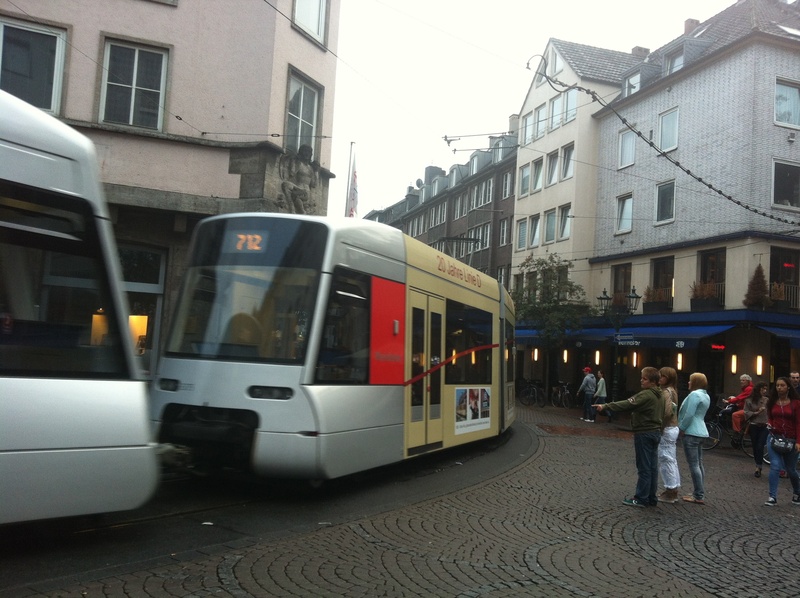 A little before 5:00 pm, we took the tram (subway) to Dusseldorf HBF, what seemed like a major station in the middle of the city. From there, we walked for about 40 minutes in the rain until we reached the Rhine River, and found there was a neat Urban Art Festival happening, with live music, exhibitions for the kids and, most importantly, a little stand selling curry wurst (a curry-sauced sausage) and pomme frites (French fries). Yes, we had centered this entire layover on curry wurst! 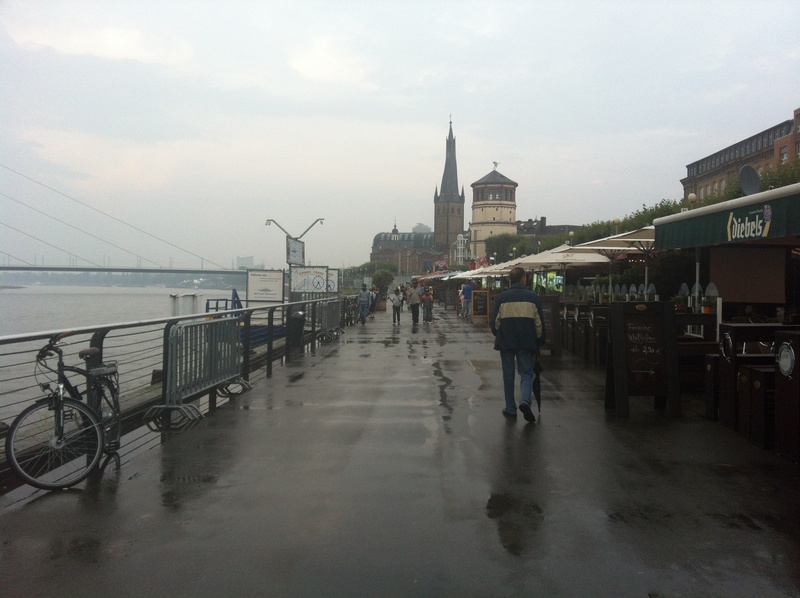 We had also wanted to take a Rhine boat tour, but didn’t look too hard for it since it was already raining and getting a little late. Back to the train station we headed, with some really shady looking, possibly strung out/ drunk/prostitute types hanging out nearby. We did a little running around the station, getting more Euros from a bank machine (we had run our wallets DRY at this point), getting change for said Euros (the ticketing machine didn’t accept anything larger than a ten-dollar bill), and trying to select the correct of many options of destination/train/platform etc. When in doubt, ask for help! One thing I’ve noticed is that in all of Europe (that we’d visited, at least), everyone was able to accommodate us in English! Though it was our shortest stay, I found this little town most intriguing. It’s so friggin’ OLD but preserved so beautifully. And I can’t help but think back to the days when Germany was at war, and how lucky we are to be of many ethnicities sharing the streets, restaurants, and other public areas today. What could it possibly have been like back then?! I’m so glad we don’t know firsthand! Pics are below. It’s been an amazing two weeks. Please feel free to add any comments or ask questions about anything relating to our travels- tips, directions (look at me attempting to offer help with directions- haha! ask at your own risk!) -anything at all. I will answer each and every inquiry! Real world, here I come (back). I got a lot of effin’ homework to do!